After the establishing and unveiling of the Stirlingmotor-monument in 2008 we started an investigation after the three allied bombers, which crashed in 1943 on the countryside of our village Markelo. Seventeen allied wargraves at the General Cemetery are the silent witnesses of these horrible circumstances. Thanks to the help of the Local History Foundation “Stichting Heemkunde Markelo” and many more people in The Netherlands and abroad, we received much information and many pictures about these bombers, their missions and their crew. A special “thank you” is going out to Darryl Robertson from Nelson, New Zealand. Darryl is the second cousin of the Stirling Bomb-aimer Flight Sergeant Andrew McEwin. Darryl spent a lot of time and efforts in tracing families of the total of 21 crewmembers involved. Thanks to them we got a lot of information which was unknown at Markelo so far. In this way we learned substantially more about the personal backgrounds of 20 out of 21 airmen. Now it is possible to give substance to our endeavour: “faces to graves”. In June 2013, at the 70-years Commemoration at the General Cemetery, a new monument was unveiled and so was a plaque with the names of all 21 crewmembers. Thanks to the courtesy of the Commonwealth War Graves Commission (CWGC) and the support of the Municipality Hof van Twente. Another special plaque was unveiled for the Halifax Air-gunner Flight Sergeant Roy Victor Ledger. He also belonged to the victims. Regrettably no human remains or other evidence of him were found, so he is booked ”missing in action” and never got a last resting place. His name is mentioned on the Air Forces Memorial Runnymede Egham. With the new propeller-monument at the General Cemetery we honour all brave airmen fallen in Markelo. Now and in the future. Writing this foreword, the set-up for the Commemoration on the 23rd of June is in full swing. Already now we can say that the co-operation and the support is awesome and heartwarming. Many relatives and authorities from Commonwealth countries made a commitment to join us on that occasion. But also in The Netherlands there is a great interest in being present on Saturday, the 23rd of June 2018. Benny Schreurs, Chairman of the Foundation Committee Fallen Airmen Memorial Markelo. In 1943, within a time frame of approximately three months, three Bombers of the Royal Air Force crashed in Markelo. On the 2nd of March the Halifax W7877 at the corner Tichelweg/Stokkumerweg; on the 24th of May the Lancaster W4861 at the Witterietsweg and on the 23rd of June the Stirling EF399 at the Traasweg. The sad balance: 18 of the 21 crewmembers were killed. 17 of them were identified and were buried at the General Cemetery in Markelo. 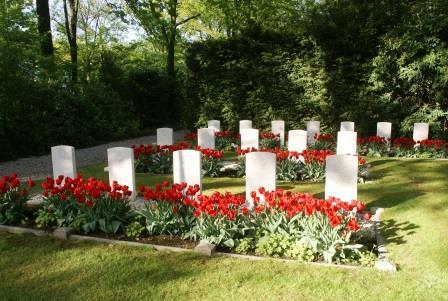 Seventy years later, on the 21st of June 2013, a new monument was unveiled on the Field of Honour with the 17 wargraves. Attended by many relatives of the victims and many other interested people. As already mentioned in the foreword. To achieve realization of this project a new foundation was established: “Committee Fallen Airmen Memorial Markelo” (FAMM). Founders: Benny Schreurs (Chairman) and late Egbert Holterman (Treasurer). They both were members of the Committee ”Foundation for Cultural Historical Elements Around Markelo”. And as such very closely involved with the Commemorations of 2008 and the unveiling of the Stirling aircraft-monument at the Kattenberg. In 2010 both were also involved with the 65th anniversary celebration of the liberation of Markelo. These commemorations were attended by many dignitaries as, for instance: the Ambassador of New Zealand and representatives of the British and Australian Embassy, of the Commonwealth War Graves Commission and of the Royal Dutch Airforce. As a result of the above mentioned ceremonies many reactions have been received, both from abroad and from The Netherlands. Even the Minister of Defence, Dr. Wayne Mapp from New Zealand, made a trip to Markelo. Also many relatives of the fallen airmen from New Zealand and Great Britain especially visited Markelo. It became clear that, unlike in many other places, there was no central area at the Field of Honour for laying wreaths or flowers. Contact was made with the Commonwealth War Graves Commission with the request to give permission for placing an authentic WWII propeller as a monument by the war graves. 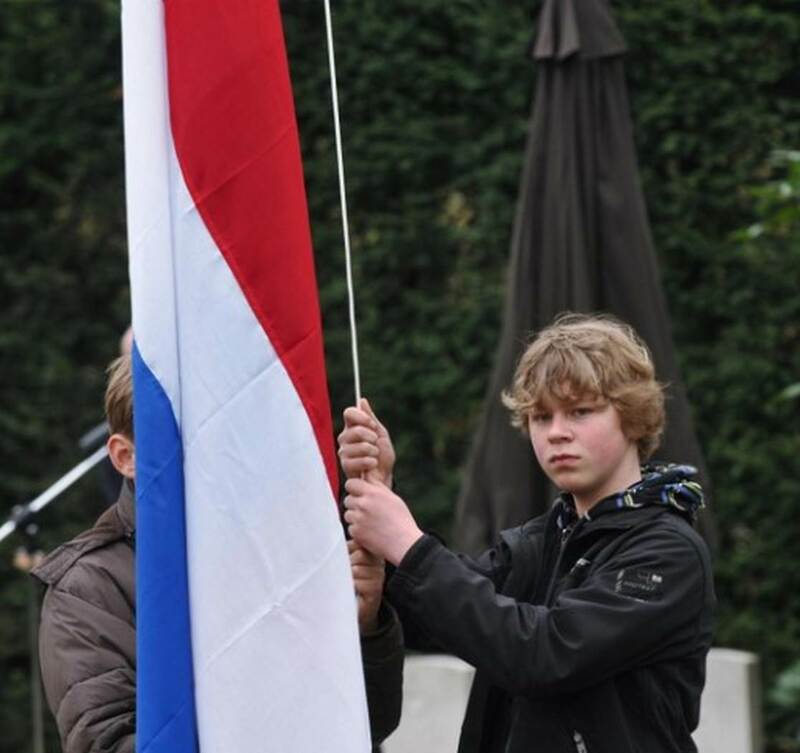 The CWGC’s reaction was positive and then the Municipality Hof van Twente offered their full co-operation. The intended propeller was bought and the plans further elaborated. The idea came up to place the monument for all three crashed bombers and all 21 crewmembers involved. As already mentioned: 17 are buried in Markelo, 1 is ”missing in action” and 3 survived. The homeland: from Great Britain 16 airmen; from New Zealand 4 and 1 from Australia. Until the end of 2010 there was only contact with the relatives of the 4 airmen from New Zealand. All 4 were crewmembers of the Stirling bomber that crashed on the flank of the Kattenberg. Darryl Robertson, related tot Andrew McEwin, had already tried in the past to contact family members of the 3 British airmen in the Stirling. Up to that time without success. In the summer of 2011, with the support of some RAF veterans and others, articles asking for contact were placed in local newspapers. Local in that sense: the birth places of the crewmembers of the bombers. The result was surprisingly positive: from 20 out of 21 airmen relatives responded. Their reactions were heartwarming and resulted in the presence of about 60 relatives who attended the unveiling of the monument in 2013. After consulting the Canada Comité Markelo an arrangement was made rather quickly. The guests could stay for a week at local host-families. These families had already hosted Canadian veterans and their families in the past. At the celebration of the 65-year liberation of Markelo in 2010 there was also a co-operation with Keep Them Roling. With over one hundred vehicles they made a Liberty Tour and also attended the commemoration at the General Cemetery in Markelo. During the Memorial in 2013 the KTR was stand-by and took care of the transport of the foreign visitors. The local member of KTR, Erik Nijenhuis, is a board member of the FAMM. Important is also the participation of the schoolchildren. The highest school classes of the primary schools in Markelo have, years ago, adopted the war graves. They take part in the commemorations by laying flowers on the graves. In this way the memory is kept alive and the awareness that our freedom is not self-evident and was not for free. There has been paid for. Many, many victims, most of them young, made the ultimate sacrifice: their live! A well-known saying is: “for our today they gave their tomorrow”. Honouring and remembering them is a moral duty.